Michael's manager since 1989 has been Willi Weber. 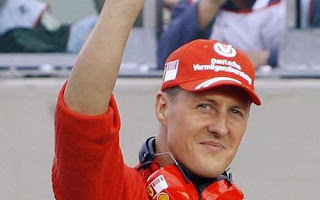 Schumacher was to receive a free drive in his WTS team for three years, Weber in return is reported to receive 20% of all income Michael earns from motor races. The initial agreement was to last 10 years, however it was later extended for a further several years. "From the area of the visor you see the traditional German black-red-gold. I chose the colours years ago with a friend of mine and I changed it only slightly, mostly to include sponsor decals. The blue circle with the white stars on the top was his idea. After joining Ferrari I added the prancing horse on the back. " Since the European GP in 2000, Michael has raced with a modified helmet design. The blue circle on the top in now painted light red. The white Marlboro stripe around the top is also now red. 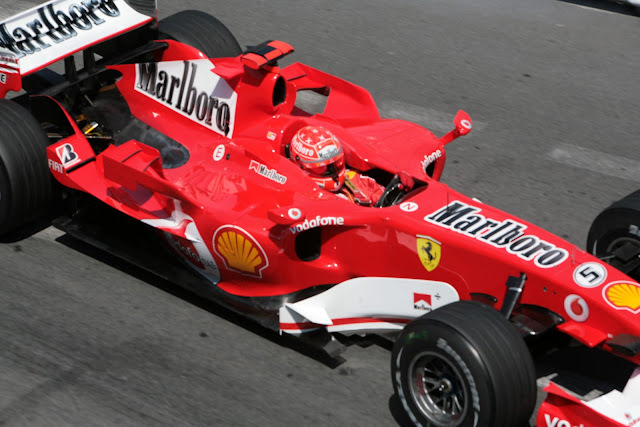 The change was made to prevent confusion between himself and Barrichello, whose design was confusingly similar. Schuey entered only one race for Jordan - which was his F1 debut at Spa Francorchamps in 1991. He qualified 7th but in the race the clutch burnt out and he didn't make it off the grid. He was standing in for Bertrand Gachot, who had been jailed in London just before the GP for an assault with CS gas on a taxi driver! Michael is Ferrari's most successful driver ever, ahead of Niki Lauda.